While we work on creating some shiny new stuff for you all this month, please enjoy a look back at some of our most popular episodes. You must really like episode 1, because it just keeps racking up the downloads. 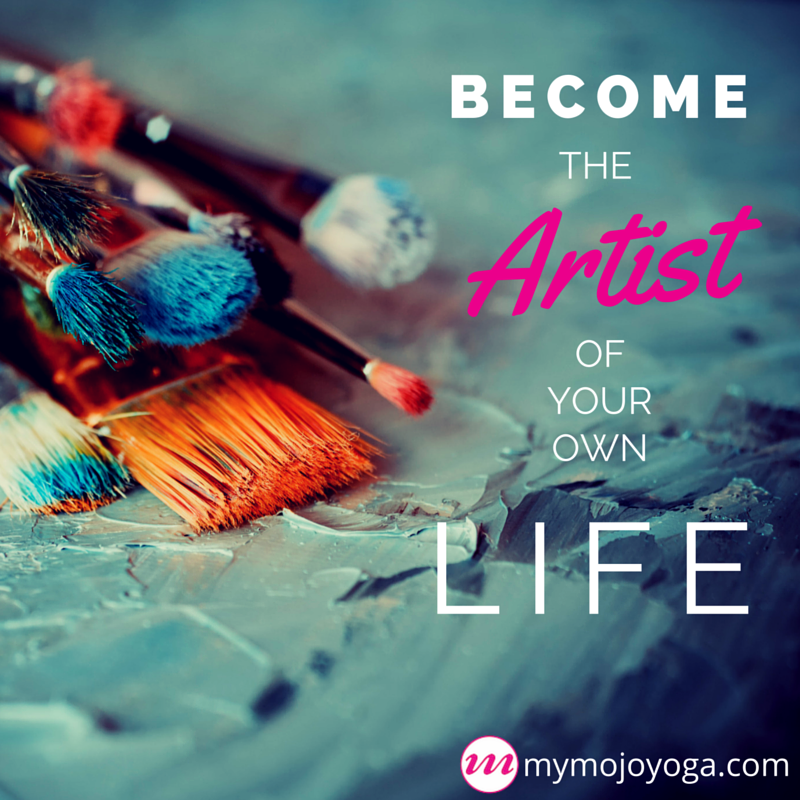 So, here it is, the very first episode of The MOJO Show and one of my personal favorite pieces on the blog: The Gunas In Your Goals, with an updated 2016 edition of Year by Design. This is such an appropriate topic for all of us as we enter the second month of a new year: precisely the time when it gets really tough to stick with our goals that we set in January. Keeping the gunas in mind when it comes to our goals can help us stick with it for the long haul and make tremendous progress. Plus, just like with any goals that we put a lot of work into, it can be really astonishing to look back at where we began and just how much progress we've already made. I know I certainly feel that way listening back to this first episode of our podcast! You know, we've all come a long way already in this new year, and I can't wait to see where our efforts take us into the future! Iiiit's The MOJO Show: Episode 1! That's right, folks, we're venturing into the podcast world with this our inaugural episode of The MOJO Show. Now, you can get your weekly dose of MOJO wisdom all up in your ears while you get ready to leave the house, drive or commute to work, or heck, while you work! The MOJO Show is unlike anything we've done to date: co-founder Scott Johnson will be joining me, Jean Marie, each week to get candid and real about the topics we cover in the blog. And knowing how much Scott talks, we'll probably cover much more that I can't even imagine at the moment. This is the realization of a huge, longstanding goal of ours. We really hope you have as much fun tuning in to the episodes as we do making them. The Goonies? Nope, Gunas will be the topic of discussion here, my friends. We’ll get to what those are in a bit. But first, the world is always turning and time is always burning. My elders always warned me that time speeds up as you age, but really, who ever believes that until we experience it for ourselves? Well, we may not have much control over the movement of time, but we do have some measure of intelligence we can exercise over how we experience that passage of time and what we make of it. That's why it's a perfect time to check in with our goals. Some of you may have set goals along with us at the beginning of this year, and for you the halfway point of the year is a vital time to review your progress so far (without judgment! ), make adjustments to your plan, and carry it forward. If you missed our goal setting sessions at the beginning of the year, never fear. There's no time better than the present moment for pausing, deciding where you'd like the rest of your year to go, and taking intentional action. If we all link arms and agree to walk the rest of the year together towards higher goals for ourselves, we'll have a grand old time at the end of the year, patting ourselves on the back for having achieved something which we set our sights on. There's really no better feeling than moving ourselves forward with our intelligence in action. Our revamped goals sheets are available for free download at the end of this post, so grab them for yourself and share with a friend! As you think about your goals, your progress and where you'd like to go still, I urge you to keep in mind the biggest key to success in goal setting: BALANCE. One of the biggest reasons we fail at following through on goals lies in ignoring realistic balance in our planning. We set goals that are outrageous and action plans to get there that look nothing like our current day-to-day existence, and then are dismayed when we can't manage to fit those lofty plans in amongst our garden of firmly rooted habits, routines, chores, obligations, and responsibilities. Our goal setting falters from the first step. So rather than giving up on goal setting altogether, we just have to be smarter monkeys and play the game according to the rules at hand. In this case, I think it's helpful to remember the gunas. These are the 3 basic elements of all existence according to yogic philosophy. They are, according to BKS Iyengar's interpretation, "tamas (mass or inertia), rajas (vibrancy or dynamism), and sattva (luminosity or the quality of light)" or more succinctly, "solidity, dynamism, and light." He compares them to the 3 primary colors on an artist's palette, capable of mixing and remixing into any combination of shade. The dynamic, constantly shifting balance of the 3 gunas determine the qualities of any given thing in existence. Coming to understand the interaction of these 3 inherent qualities is critical in our yoga practice, as we can then learn how to identify imbalances and make adjustments accordingly to bring our elements into harmony and balance. For instance, we can learn to see when inertia is strong and apply dynamism to incite progress and invite into our beings a greater proportion of lightness. On the other hand, we can also identify when we're frenetic or agitated, and apply solidity in equal measure to bring ourselves back into balance where we can see and experience luminosity again. 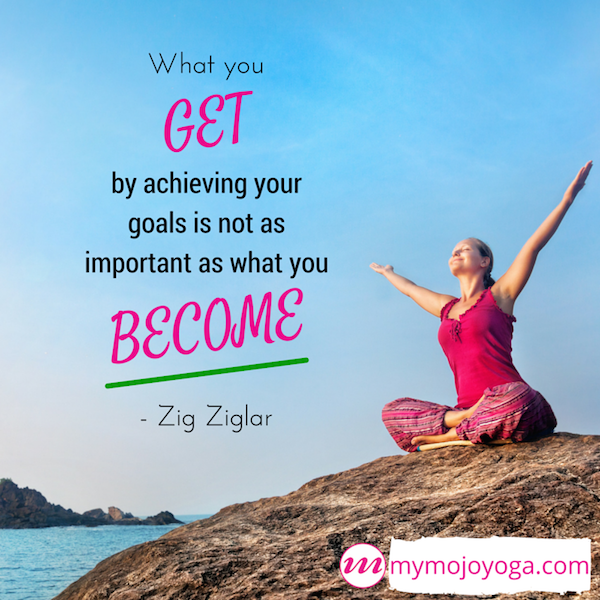 What do the gunas have to do with your goals, then? Everything. Well, to be more specific, it's all about the balance in our planning and the balance in our beings. To start with our planning, look back at the goals you set already and the action plans you laid out to get yourself there. In the places you fell off and missed the mark, can you identify an imbalance in your plans? Perhaps they were too dynamic or frantic to be realistically attained in your current day-to-day? Or perhaps they had too much mass for you to be able to set them in motion? As we adjust our goals for the rest of the year, let's bring them into a state of better balance between movable mass, reasonable energy, and ease of effort. Luminosity will come of that balance as we readily achieve our goals. As for balance in our beings, when you look back on your progress (if you set goals prior to this), look at where your action plans fell off. If you have your plans attached to a calendar in any way (highly recommended), think back to the time when you dropped off your plans. What was happening in your life then? We're not looking for an incident to "blame" here. We're looking more at the general qualities present in our beings and our lives - the balance of our gunas at the time. Can you see what your imbalance was - predominantly turbulence or inertia? Can you then imagine some steps you could have taken to right that imbalance had you noticed it? When our own gunas are out of balance, it's much like trying to drive a car with misaligned tires. Depending on the severity of the imbalance, it could be days or months before we notice it, but all the while we're traveling inefficiently, wearing our parts out unevenly, and without proper effort applied to directional progress we swerve around on our path, sometimes dangerously so. Fortunately our yoga practice offers us the chance to keep a close eye on our balance of gunas and make adjustments more quickly and intelligently as they're needed - for they're most certainly, nearly constantly, needed. It’s with these keen observations of the balance in our own lives and selves, combined with a balanced approach to goal setting that we can actually achieve greater and greater things for ourselves. We don't have to beat ourselves up for failing or shun goals setting altogether as something unattainable. Rather, we become the artists of our own lives, always mixing and adjusting the elements of our medium into precisely the colors, forms, and dimensions of our best dreams and visions. A great exercise for improving self observation that you can do in just a few minutes is the subject of our free video of the week: “Marma Points For Flexibility.” If you like this video, you can have 24/7 access to it and an ever-expanding library of classes in the MOJO Member Space. Join us there!